Do you know why people mix and match different strains of cannabis? This is because they wish to make the experience a lot stronger than it should normally be. Besides getting you a better flavor, mixing strains can help take the edge off of an extremely potent bud. The mixed Marijuana Strains option contains an assortment of top shelf strains that are individually labeled. If you have a number of different strains lying around, there’s a possibility that you’ve mixed them before. There are many great strains of cannabis to match, and one of the most important reasons people do is to maximize the effectiveness of the herbs and add some depth to the overall experience. 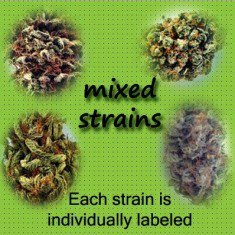 Why buy Mixed Marijuana strains? When THC and CBD strains are mixed, the powerful medicinal effects of the two major cannabis compounds are enhanced. These compounds expand each other. This is called the “Entourage Effect”. There are very great strains to pair and you can always make your options. You can order our combination of Granddaddy and Sour Diesel, and any other two strains you think are perfect for your medicinal or recreational use. The combination of the two will depend on how much of each one you use. Yet, mixing and matching will likely earn you a pleasant yet potent hybrid effect. Mixing and matching cannabis strains can deal you a whole lot of benefits and advantages. Get this exclusive offer from us in Santa Barbara now! Highly satisfied with the mixed strains. Great variety…high quality stuff.